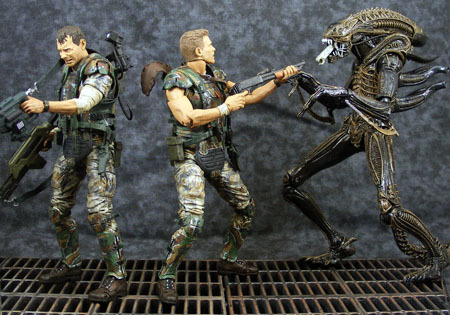 Until now, the NECA Alien vs. 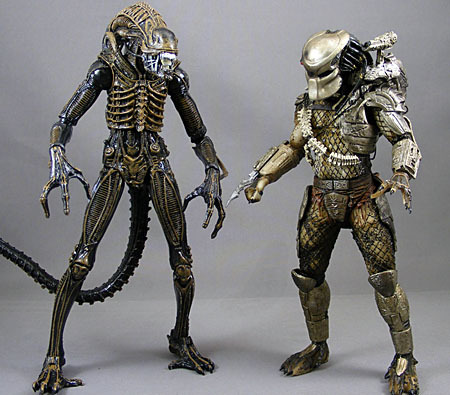 Predator: Requiem figure has been the best Alien action figure, despite coming from a terrible film. 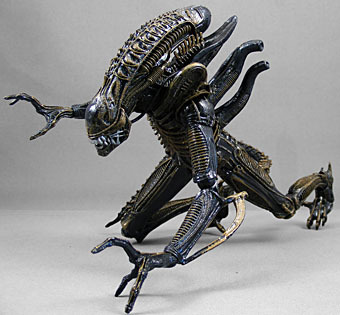 So, does the new Xenomorph Warrior from Aliens take the crown? As mentioned in previous reviews, the guys at NECA are sticklers for accuracy on these movie licenses, and that's on display here. I'm not the sort of person to really get bogged down in the details, so I can't speak to how screen-accurate this figure is. I can't say whether every biomechanical wire is where it should be, if there are the right number of ribs or that the fin on the back of the neck is the correct length. I tend to assess sculpt more generally: is it sharp and detailed, or soft? Is the basic body shape correct? Are the memorable, distinctive bits of this version of the Alien in evidence? The sculpt is definitely sharp, there's no question of that. As for body shape, it's an improvement upon the slender body of their previous Alien Warrior. The trunk seems a bit thicker, the head slightly larger and fatter - all important aspects of the character as it looked in Aliens. That said, the head still looks a little too high on the neck, and the tubes just above the shoulders seem a bit low. However, it should be noted that my impression of the Aliens xenomorph is based on the famous door poster, which may or may not be an accurate depiction of the suit as it looked in the film. It's entirely possible (probably likely) the new figure's sculpt is accurate. As for the distinctive parts of this design, they're all there: the ridged head, the way the fingers seemed joined together to create a more inhuman three-fingered look (compared to the five fingers of the creature from the original Alien), and the narrow tail with the small barbs. On a side note, I always liked the explanation I read - somewhere - that the reason the xenomorphs in Aliens had ridged instead of smooth heads was because the smooth head was a protective shell when the creature is younger, and eventually molts off once the flesh below has hardened into a tough, ridged shell. NECA's previous attempt at this figure had some major design flaws. The worst were the "fins" on the back of the forearms: the top connected on the other side of the elbow joint, which meant that moving it to a perpendicular position stressed the tenuous connection to the lower biceps. Unless you never moved the elbows, that connection was going to break. That issue has been solved by putting both connecting parts of the fin on the forearm. This may not be entirely accurate to the design, but it's a minor point that greatly improves the figure's quality and play value. The other issue with the previous figure were the two thin "wires" on either side of the neck. If you moved the neck around much, those wires were in danger of breaking. NECA has given the wires a lot more slack this time, so it's far less likely to break. Paint tends to be very hit-and-miss for them, and in this case, it's a mixed bag. The brown coloring on the figure is apparently accurate to the film. The problem is that Aliens is actually a pretty colorful film, at least in terms of lighting, and the aliens are never standing around in direct white light as they are in production photos. And so everyone's impression of the creatures in the film is that they're either all-black, or perhaps black with some bluish highlights. I don't like the brown highlights personally, but I won't knock NECA for them. (I'm interested in the upcoming Genocide two-pack, which includes a version that looks to have a paint scheme that, while not necessarily more accurate to the film, gives the figure a patina that resembles the H.R. Giger art that inspired the design). 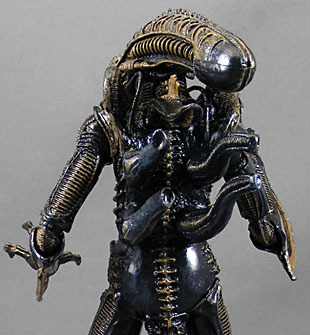 I really liked the sheen and silvery highlights of the AvP:R figure, and would love to see a version of this mold in that style. The highlights are applied as a dry brush and it looks good, bringing out all the incredibly detailed textures on the figure. What doesn't work is the gray paint on the sides of the jaws - it's applied sloppily and I'm not even sure what look it's trying to achieve. Is it supposed to represent saliva? Most of the figure is molded in hard plastic, although it seems to be of a type that's more durable than the previous figure, which was very fragile. But the dorsal tubes, the fin on the back of the neck, and the pelvis are all molded in soft plastic. I'm guessing it was used for the dorsal fins so as to make them less like to break off. The pelvis was made rubbery so as to allow the hips more room to flex while retaining the continuity of the sculpt as much as possible. It's a smart idea, but in execution it still tends to push the hips down a bit. I also worry that prolonged play with the joint might cause the plastic to tear. 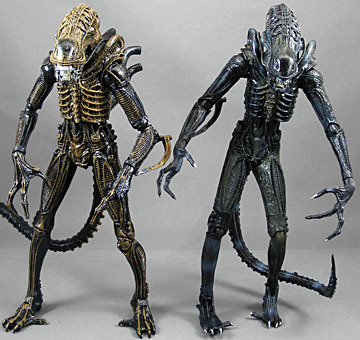 One of our Twitter followers bought two different Aliens at Toys Я Us and both had a fused hip that broke when the leg was moved, so caveat emptor. If you get an Alien, check his articulation before the receipt expires. 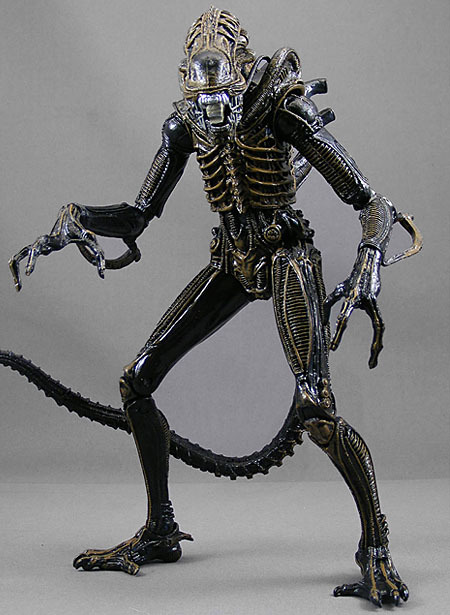 The big selling point of this figure is that it's super-articulated - perhaps the most articulated Alien ever made. There's a balljointed head with forward and back movement (the neck fin pulls out so you can tip the head back); a hinged jaw; a slide-out inner jaw; balljointed shoulders; swivel biceps; double-hinged elbows; balljointed wrists; balljointed torso; balljointed hips; swivels at the top of the hip; double-hinged knees; and hinged toes. The ankle is a true ball-and-socket balljoint, but the ball has been molded with thick, flat "bumps" all over it to create a sturdier joint that feels like a ratchet when you move it. The tail is a bendy, and like all NECA bendy stuff in recent years, it works very well and holds its shape with no problem. While it's fantastic the figure has this much articulation, there are a couple things to be aware of. First, you're going to have to work to get it into poses you like. The joints are often resistant and the ratcheting joints can be tricky, especially if you're trying to get it into a pose with both feet lying flat on the ground. The rubber pelvis will fight you a bit when you're trying to get the thighs in a raised position, which limits the usefulness of the double-jointed knees somewhat. Also, the figure is pretty heavy, so while all this articulation is great, you may have a hard time actually displaying it in a cool pose. It has no holes in its feet for stands, and I don't think even a Tamashii Stage Act 5 stand is going to be strong enough to hold him around the waist. You're going to need a Mattel flight stand or something similarly strong for good leaping poses. Truth be told, I didn't spend a whole lot of time trying to come up with really good poses, and I suspect a lot more is possible than you see here - even without a stand - if you have the patience to work with the figure and find a good center of balance. All that said, in terms of play value, the articulation is fantastic. I foresee plenty of really cool Aliens vs. Predator dioramas in the future. 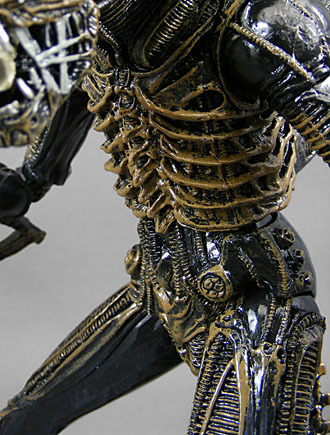 So, is this the ultimate Alien figure? Does it overtake the Requiem version? It's very close. From a design standpoint, the AvP:R Alien is hard to beat, even with fewer points of articulation. It stands solid and it's durable, it has a great color and paint scheme, and it even comes with a sculpted stand. But at the end of the day, it's still the AvP:R version of the Alien. This figure portrays my favorite Alien, the one I grew up loving the most, and NECA has given it all the articulation it needs. You do need to be patient to find the sweet spots for posing, but it can be done. The sculpt is excellent and it fixes a number of issues with the previous version. While this may not be my perfect Alien - I suspect the Series 2 "blue" colorscheme will work better for me (similar to the Prometheus Engineer, I probably wouldn't have bought one if NECA hadn't provided one for review) - it's the best figure of this version of the character at this pricepoint so far.